Before you order a wedding ring online, you will need to know your ring size. The very best way to obtain your ring size is to visit a jeweler and have them professionally measure your ring finger. Most jewelry stores have “blanks” which are simply round pieces of metal made to different sizes. A salesperson can use these blanks to get a very accurate measure of your ring finger size. We realize that walking into a jewelry store to only obtain a ring size may not the thing to do. Or, you may simply not have the time to visit your local jeweler. For those that cannot visit a jewelry store to get their ring finger measured, we have created a downloadable ring sizer. 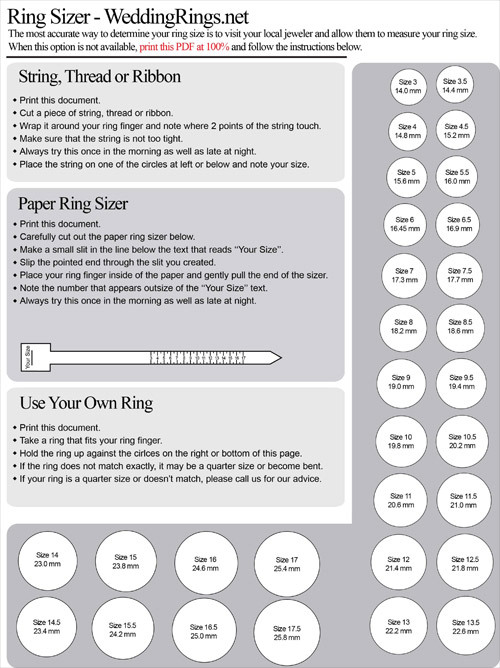 Click here to download and print our downloadable ring sizer. Please keep in mind that if your wedding day is approaching and you don’t want to take a chance on receiving a ring that doesn’t fit perfectly, we have the following suggestion. If you can afford it, we recommend ordering the size you believe will fit as well as one size below and one size above this. You can then take up to 30 days to return the two rings that don’t fit. We will immediately refund your payment source upon receipt of the rings.